Okay, I didn’t write this sketch – Matt Blitz did – but I’m posting it on my blog for three reasons: it features our guest star from this past Sunday, Matthew Gray Gubler aka Dr. Spencer Reid from CBS’ “Criminal Minds;” it’s about the USA in the World Cup, which is super timely this morning; and it’s hilarious. Sometimes there’s nothing funnier than watching a guy get kicked in his junk. Matthew Gray Gubler – Dr. Spencer Reid from CBS’ “Criminal Minds” – guest starred in Top Story! Weekly Sunday and could not have been nicer – or funnier! Here’s the opening sketch from that show – based upon a comment that Gregg Lopez made over a year ago when we were picking names for the show, about the likelihood that someone might confuse our show’s name with the name of a certain Pixar franchise whose latest installment opened this past weekend! The participation of North Korea in the World Cup gave me a chance to write and direct a sketch with Artemis Pebdani’s always-hilarious interpretation of Kim Jong-Il – this time, with his invisible phone! North Korea’s World Cup team may not have a lot of fans, but they do have their number one superfan – Kim…er, Jim Jong-Il! After Carly Fiorina’s little misadventure with the open mic, I wrote this sketch for Top Story! Weekly – Melissa Okey did a great job as Carly! After Carly Fiorina makes a snide remark into an open mic about Barbara Boxer’s hairstyle – she decides to take her act to Fresno’s Chuckle Hut! The Top Story! Weekly Cast with Matthew Gray Gubler!! Here’s the Top Story! 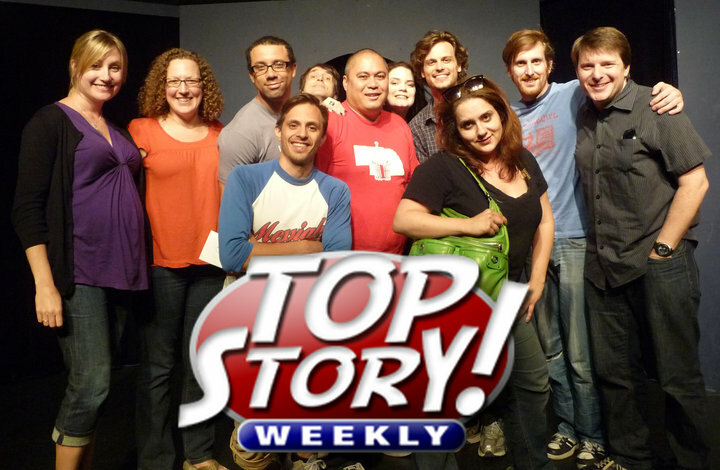 Weekly cast with Matthew Gray Gubler on the iO West Mainstage right after rehearsal on June 20, 2010 – Matthew and Emo Philips did the show that night! Videos of the sketches from the show will be up in the next few days – check out our website or our YouTube page!! Matthew Gray Gubler and Emo Philips in Top Story! Weekly! Sunday June 20 9pm iO West!! And our guest standup will be our good friend, the one and only Emo Philips!! You won’t want to miss this very special edition of Top Story! Weekly – if you want to buy your tickets in advance, you can do so here. The sad loss of Rue McClanahan gave us at Top Story! Weekly a chance to pay tribute with a “Golden Girls” parody. Unfortunately some really funny lines got lost when actors went up, but it’s still pretty funny. Golden Girls Dorothy Zbornak and Sophia Petrillo get a wonderful surprise in the afterlife, when Blanche Devereaux arrives! Artemis Pebdani’s Elena Kagan is so hilarious that when news broke of her senior thesis being about socialism I couldn’t resist the chance to have some fun with a collegiate flashback. As a freshman at Princeton in 1977, there’s two things that Elena Kagan loved – socialism, and partying down! You are currently browsing the Mike Hughes' blog blog archives for June, 2010.